Katy McElligott is a Regional Development Officer at Grameen Foundation and is currently traveling in Haiti to visit our partners at Fonkoze. Haiti is a fascinating place. My first impressions just scratch the surface of a very complicated country with a very complicated history. I knew very little about it until the day I arrived and am soaking up as much as I can, so I can understand the context in which most of Haiti’s citizens and microfinance clients survive. 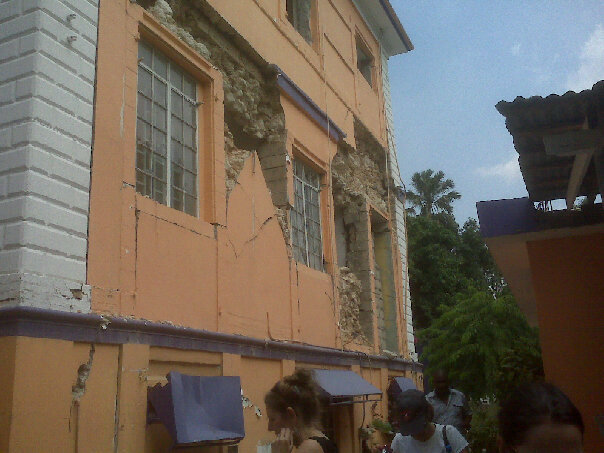 I can honestly say, the majority of Haiti’s citizens seem to be proud, resilient survivors. I am on this trip as a Grameen Foundation employee looking to better understand the work of our long-time partner Fonkoze. After the outpouring of support for Haiti after last January’s earthquake, I wanted to bring donors to the field to see how their, and others’, money was being invested. After a few days of observing Fonkoze’s work on the ground, I am so proud that we are partnering with them. Here are a few examples of what I’ve seen and learned. 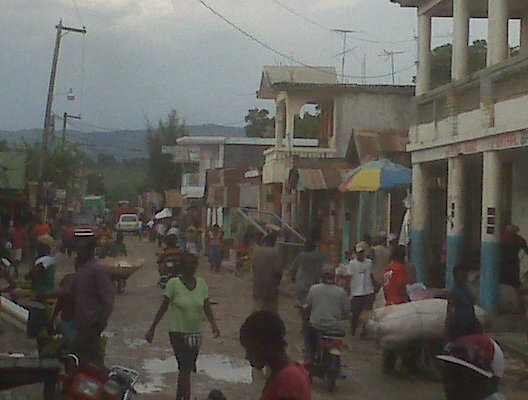 Residents of Mirbale go about their business after a rainshower. Camilla Nestor is Grameen Foundation’s Vice President for Microfinance Programs. Starting today, hundreds will gather at the fifth annual Clinton Global Initiative (CGI) to publicly declare their commitment to alleviating some of the world’s most pressing social concerns. This year’s event also marks a milestone for Grameen Foundation. Five years ago we were part of the inaugural meeting, where we launched the Grameen Foundation Growth Guarantees Program – an initiative designed to increase microfinance clients’ access to loans by guaranteeing local funding for the microfinance institutions (MFIs) that serve them. With news of successful IPOs in the microfinance industry, one might think that MFIs’ financing problems have been solved. However, when MFIs are asked what their top constraints are, financing – particularly, local currency financing or patient social equity – tops the list. This is one of the key benefits of the Growth Guarantees Program. 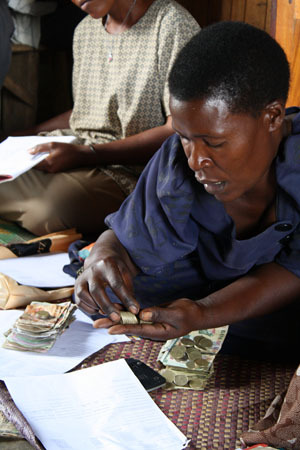 By focusing solely on local currency loans, the program helps MFIs avoid the foreign-exchange risk inherent in hard-currency loans (typically in U.S. dollars or Euros), while enabling them to build important linkages with their local commercial banks. This milestone marker is also a reminder of the work that still lies ahead. In partnership with USAID, the Schwab Charitable Fund and others, we are working to leverage idle wealth in the US to generate growth capital for MFIs at a leverage factor of 3x (in other words, for every dollar of guarantee we place, the MFI can lend $3 to its clients). We are currently increasing our focus on regions and countries where commercial banks have yet to engage actively in the financing of microfinance in order to unlock capital for MFIs in their local markets. Preeti Wali is Communications Officer at the Grameen Foundation Social Performance Management Center (SPMC). She is based in Washington, DC. Grameen Foundation is leveraging the value of volunteers to certify the use of the Progress out of Poverty Index™ (PPI™) by MFIs around the globe. We‘re recruiting and providing specialized training to a reserve corps of Bankers without Borders volunteers preparing them to document and gather the necessary information to apply the PPI Standards of Use through a certification process to PPI users. We’ve just started this process through a pilot certification of two MFIs, ESAF Microfinance (India) and FINCA Peru. The formal certification program will be rolled out this fall. Peru was to conduct a Grameen Foundation certification of the use of the Progress out of Poverty Index™ (PPI™) at FINCA Peru. The PPI is a 10-question poverty assessment tool that helps poverty-focused organizations to understand the poverty distribution of the their clients and target clients, track poverty over time, and to adjust their products and services to best serve their clients in moving out of poverty. It was encouraging to see that Iris had learned as much from the PPI questionnaires completed by her clients as I did. She was surprised to glean from a PPI sample study that fewer than expected of her clients sampled were below the poverty line. The information reinforced FINCA Peru’s strategy to focus on more rural clients to reach the poorest in Peru. Continue reading Mia’s blog post. Over the course of one week, I work closely with ESAF’s PPI Manager, Benita, and am privileged to have access to staff from the managing director to the loan officers, as well as to be introduced to several ESAF India clients. Based on my interactions, it seems to me that ESAF India is committed to meeting their clients’ needs and social goals. As the PPI contributes to both, they are in the process of implementing various processes and training to achieve best-in-class PPI use. Continue reading Jamie’s blog post. Do the poor need financial literacy? Olga Morawczynski is Project Manager for Grameen Foundation’s financial literacy project in Uganda. When I started the financial literacy project at the Grameen Foundation in Uganda, I was faced with some very fundamental questions—what exactly is financial literacy? And do the poor really need it, or even want it? Aside from my own questions, I also faced some reservations from colleagues in the field. Many were very frank in their opinions. There is no need for financial literacy, they told me. What the industry needs is appropriate financial products. The learning bit will take care of itself. I have spent the last months travelling around Uganda and speaking with individuals who depend on a wide variety of livelihoods, from fishing to trading and farming. And I have made some extremely interesting discoveries. Amongst the people I spoke to, there was a clear demand for financial information. Many of my informants did not have a lot of money, and their inflows of cash were extremely irregular. But they had many questions on how to manage it better. A significant portion wanted advice on savings and budgeting. As one farmer explained, “when you have so little, you have to become an expert at managing it. If not, it will disappear from your hands before you even had the time to count it”. But what makes one an expert at managing their cash? “When times are good, you put cash away”, the farmer explained. “So when the cash is not flowing, you have something saved”. I asked what happens if you don’t have something little saved. The farmer pointed to a small herd of his cows. “You sell one of them”, he said. So maybe that brings us a little bit closer in our understanding of what financial literacy is and what it should do. That is, helping people to plan accordingly so they are prepared for the periods of cash deficits. And when you are an expert, you get to keep your cows.